Hong Kong has a popular ‘junk’ boat culture in terms of weekend boating during the summer months, but the issue of junk that contributes to water pollution in our oceans is largely ignored. According to the United Nations Environment Programme (UNEP), more than 4,000,000 tons of garbage enters the sea every year. Victoria Harbour has long been the heart of Hong Kong but it is no exception to this human induced problem. In fact the marine pollution is magnified in Hong Kong due to its high-density population and relatively small area of surrounding land. The issue of plastic waste goes beyond affecting our local marine ecosystems, this impacts tourism, human health, and our local food quality. Approximately 80% of plastic pollution is from sources on land, from industrial waste, domestic sewage and reclamation activities. So yes, it is our problem! What can be done? First step—get informed. Education and awareness is key to understanding, and Ocean Recovery Alliance offers this unique opportunity. Ocean Recovery Alliance is a registered Hong Kong charity. The organisation cultivates ideas, technologies, and creativity in order to introduce innovative initiatives that will help improve our ocean environment and together educate the public. Ocean Recovery Alliance creates the balance by integrating local Hong Kong ‘junk’ culture into a hands-on learning experience about our marine environment. 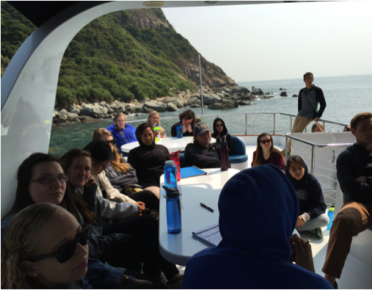 This past weekend, I embarked on this journey with the Ocean Recovery Alliance team and a group of eager students and adults from Semester at Sea who were docked in Hong Kong for a few days. Semester at Sea offers their passengers, from 30 different nationalities and all age groups, a variety of university degree disciplines, a multicultural experience of sea exploration and educational learning whilst travelling the world. Groups perform visual surveys to get a firsthand experience of the extent to which plastic waste is evident in Hong Kong waters. A brief overview of the global situation of plastic waste in our oceans is provided, with water samples of microscopic plastics being passed around. An engaging dialogue of achievable solutions and questions soon follows. 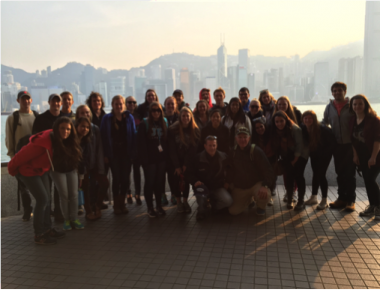 In addition to discussions about plastic pollution, groups had the chance to stop over on Lamma Island to try out local Hong Kong delicacies and to learn about sustainable seafood while dining at one of the local restaurants by the pier. What if everything we discarded as trash had our names on it? Would we be more observant of our habits as a consumer? What if we converted all our trash into monetary value? Would we waste less? What changes would this evoke? Would we be more careful to how we discard our waste? All in all, it was an interesting and thought provoking day out! I always enjoy meeting new people, from various backgrounds and keen enthusiasts about the environment like myself. It is great to see the tides are slowly but surely turning. People from different cultures, backgrounds and of various age groups coming together on one fundamental consensus. Something needs to be done to save and foster our Earths greatest asset, the ocean! Want to find out more about Ocean Recovery Alliance? Visit their website.